Thanks for your responses regarding the summer pen pal exchange. I’ll post more about it later this week and help you get one set up for your children. My girls are loving the packages they receive in the mail and they look forward to getting to know their out-of-state friends better. And those of you interested in the sand play dough recipe, I thought I would share it with you. It’ll keep the little hands in your house busy this summer. Although, like all play dough, it can leave you with a mess. So maybe you’ll want to take this one outside. 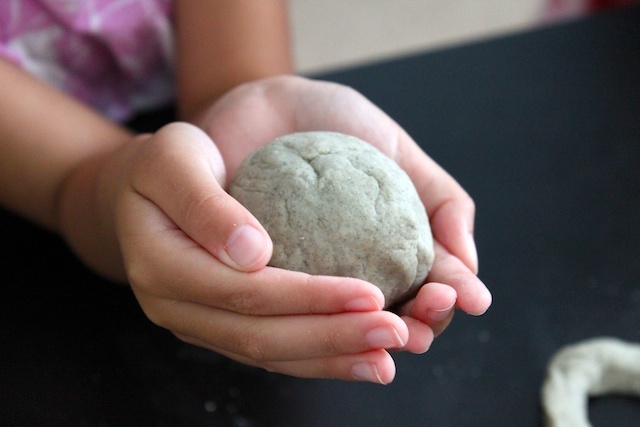 While we were vacationing in North Carolina, we brought back sand from the beach with us to make the play dough. That’s probably the cheapest way to get sand. Although, if you are concerned about making play dough with clean play sand , you can purchase them from any gardening, home improvement stores, or online . 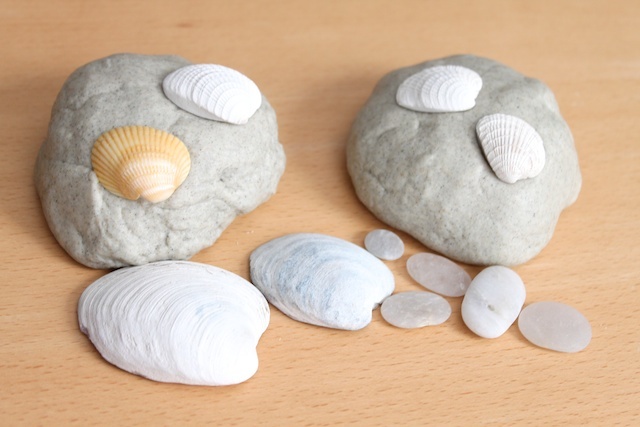 This play dough is great for building sand castles at home so bring out the beach toys and seashells. They can enjoy a little bit of ocean in their backyard or home. And this is also a great idea if you are doing a beach themed birthday party this summer. Use it as an activity or take-home gift for the children. 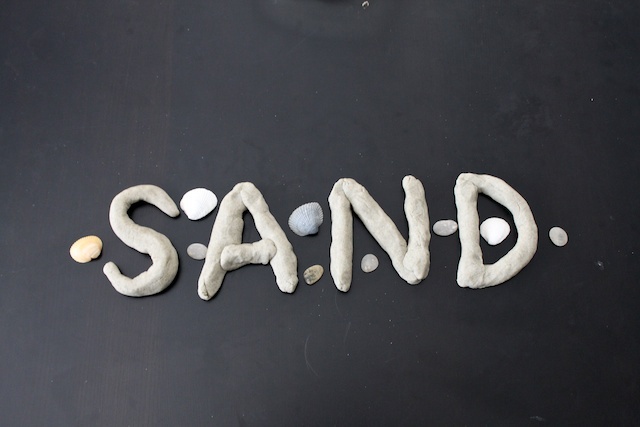 After testing out several recipes, making a few test batches and playing around with the ingredients, I finally created this sand play dough recipe that worked out the best. 1. In a large mixing bowl, combine sand, cream of tartar, cooking oil and the 1 cup of flour. Mix well. 2. Dump the boiling water all at once into the mixture and stir until the mixture forms a ball. Mix well. Use your hand to kneed it if necessary. 3. Add the last 1/4 cup of flour to the mixture to get the right consistency. Kneed it in well. If it is too dry, add a little bit more water. If it is too runny, add more flour. Store in air tight containers. Note: If you use sand from the beach, I would be cautious and watch for children putting the play dough in their mouths. And not knowing what is in the beach sand, it may mold after a few days. 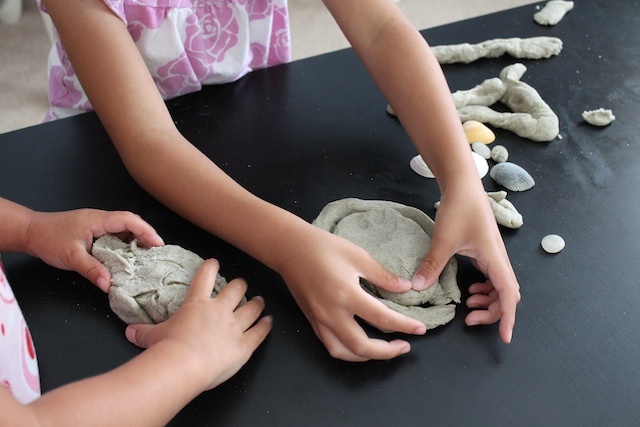 » Tell me… Do your children enjoy playing with play dough? Thanks for posting this recipe! We scooped some sand from our sandbox and made this sand play dough for my dinosaur loving 4 year old. The dough is great–pliable, soft, and not too crumbly. He is now happily creating landscapes for his dinos. Thanks! thank you, rebecca! glad you liked it! THANKS for the recipe! I made a batch using a different recipe for my preschool kiddos. They LOVED it but unfortunately it morphed overnight into something that no longer felt or smelled like anything anyone would like to put their hands in. EEEEWWWWW!!!! Your recipe was the perfect combination of fun with the ingredients needed to insure that we weren’t creating science experiments on our sensory table. 🙂 THANKS! How long does this play dough recipe usually last for you? How do you store yours? Thanks!